I wish I could have visited Spain during my jaunt through Europe in 1996, but time was short and I thought a visit to Spain would come on a later trip that has yet to materialize. One of my childhood dreams was to see the horses in Andalusia, so I must do that as well as enjoy the art, architecture, food, and music. Obviously I have a somewhat romantic view of this future yet unplanned trip, and hopefully someday I will have a chance to fulfill those dreams. Likewise, I’m afraid I’ve taken a somewhat romantic view of the latest cookbook to arrive courtesy of the folks at DK Publishing. 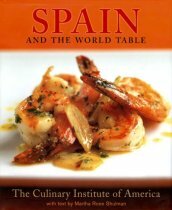 Spain and the World Table is a beautiful book from The Culinary Institute of America which featured Spanish cuisine during the 2006 Worlds of Flavor International Conference & Festival in the Napa Valley. This is more than just a cookbook, it’s a journey through Spanish cuisine with features about the history of Spanish cooking and some of the great Spanish ingredients such as hams, cheeses, wines and sherries, saffron, fresh seafood, potatoes, rice, and chocolate (yes, chocolate, and not just drinking chocolate). The book is oversized with big gorgeous photos and many recipes across eight categories, including tapas, soups, meats, seafood, rice, salads and vegetables, sauces and condiments, and desserts. The recipes represent a range of complexity, and though the book focuses on Spanish ingredients, many are widely available in the United States. Some are more costly in this country, such as serrano ham, but substitutions are often easy to find to keep the dishes within budget. So far we have made four of the dishes and I have a list of many more I plan to make, including a passion fruit ice cream I’m dying to try. We chose these recipes based on what we had on hand and what was economical, so over the weekend we made a vegetable paella, chicken chilindron, white sangria with amaretto, and shrimp in garlic. The shrimp had loads of flavor from the sauteed garlic and pepper flakes, and the wine reduction made a tasty sauce for dipping fresh artisan bread. The recipe is a bit saltier than I’m accustomed to, so I recommend tasting before adding the second round of salt. I highly recommend this book if you enjoy world cuisine and experimenting with cooking. And speaking of which, I have one copy of this beautiful book to give away. If you want to win your own copy of Spain and the World Table, leave a comment telling us about a Spanish food you enjoy or would like to try. Please make sure your email address is correct so I can contact you if you are the lucky winner. Apologies to my international readers, but the book can only be shipped within the continental U.S. The contest closes at 8 P.M. EST on Saturday May 31, and Random.org will select the winner. Look for the announcement of the winner in this post soon after. UPDATE: Congratulations to Courtney of Coco Cooks! A copy of Spain and the World Table is on its way to you! 1. Heat the olive oil in the large skillet over medium-high heat. Saute the garlic and the pepper flakes for about one minute, then add the shrimp and saute for 1 to 2 more minutes. Sprinkle on 1 teaspoon of the sea salt and a pinch of black pepper. 2. As soon as the shrimp are cooked through, remove them from the pan and set aside in a bowl or on a platter. Remove the garlic just as it starts to brown and spoon over the shrimp. Cover to keep warm. 3. Keep the heat at medium-high and add the white wine or lemon juice. Cook about 4 to 5 more minutes, until the wine reduces by three-quarters, shaking the pan frequently. 4. Taste the sauce and season with more salt and pepper as necessary. Add the chopped parsley and stir. 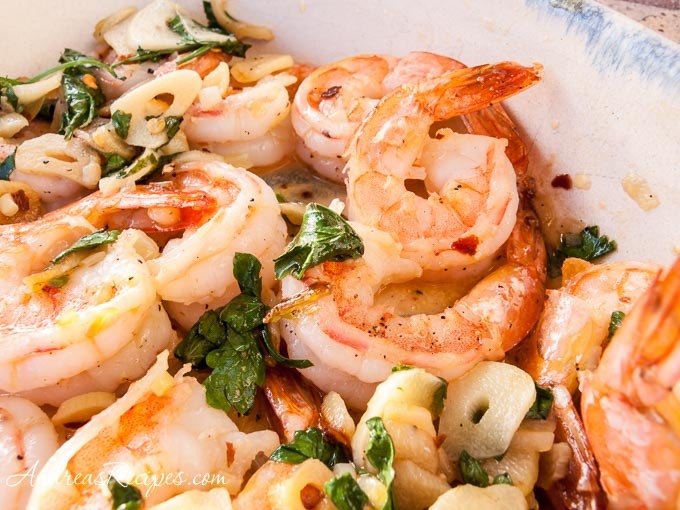 Spoon over the shrimp and garlic and serve immediately with fresh artisan bread for dipping in the sauce. Andrea, I lived min Rota, Spain (Andalusia) for two years when I was in the Navy back in the mid ’70s and just loved the food there. I was naive enough to expect Mexican food and was so delightfully surprised to discover the treat that is Spanish cuisine. One of my favorites, even to this day, is what they call an omelette, also called a frittata, because there are so many different ingredients to throw in! Love your site. How can you pick a favorite in Spanish cooking! I love all the tapas I’ve ever had and I love the paella Jason makes for us. Push me maybe I’d say the Paella is my favorite. That garlic shrimp looks fabulous! Maybe that will be my new favorite. We make a very similar dish and just love it. Yes, that seems like alot of salt. We chop up a large amount of garlic and are not stingy with the olive oil. After the shrimp have been removed from the pan, everyone gets his/her own small ramican full of the cooking juices and garlic for personal bread dipping. It’s a great communal dish, really gets people involved in the food and the meal and gets them talking. Reminds me of my trip to Barcelona and the great meals there, where the chef and staff would come out to the table and have a glass of wine. Wonderful Spanish culture and people! Ok, so let me first admit that I am a NOT a great cook… but over the past few months, I have been trying. Really trying…. to the point that I have friends coming over to help me “relearn” to cook. I have been calling it – Corrective-Emotional-Experiences. I have NEVER cooked Spanish food. EVER. But I love tapas … and well, Sangria (which I actually know how to make), surprise, surprise. i love tapas. would love to give it a try !!! thanks for hosting ..i have a giveaway on my site as well. check it out. I’m a huge fan of Tapas also! I, too, have been trying to do a much better job feeding my family. I’d love to try some Spanish food! My grandmother is Spanish and the Philippine cuisine has a strong Spanish influence, so I have lots of favorites. I do especially love Torta Espanola, croquetas, Jamon Serrano, Baccalao, paella and churros con chocolate. Yummmmmmm!! I’ve only attempted to cook the first 2, I’ve not had the courage to try the others. This cookbook sounds absolutely wonderful, maybe I’ll get lucky! My mouth was watering just looking at the pictures…I love tapas and sharing them with friends. 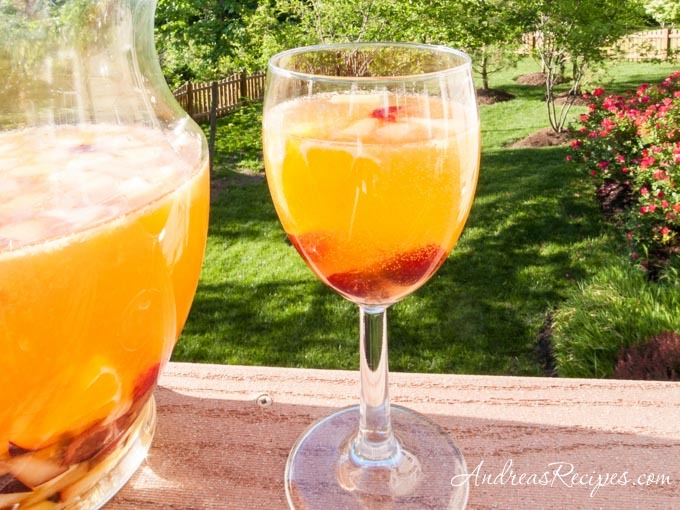 The Sangria looks tasty as well – Amaretto is a favorite of mine! Keep up the tantalizing…I’m getting better at cooking through the positive vibes!!! I would love to learn how to make an authentic paella. Those shrimp look great, Andrea. My mother-in-law gave me a paella kit for Christmas, including a paella pan, a bottle of Spanish olive oil and a package of saffron – can’t wait to try it out. We had a Spanish exchange student years ago, who introduced us to the potato frittata – I really enjoyed it, although my husband doesn’t like eggs. I love all varieties of Tapas. Just sit me down alone in a Tapas bar and let me go crazy with nice jug of sangria.Also anchcovie stuffed oilves! My husband and I ate at a Tapas bar in Dallas last summer, and my mouth still waters when I think about the delicious food and house sangria. My favorite dish was probably the red peppers stuffed with goat cheese, although the potato tortilla (more like a frittata) was a close favorite. My husband went straight for the blood sausages. All in all, if you get a chance to eat at a tapas bar, we highly recommend the experience. The food is served slowly on little plates. The meal is not rushed, but more a celebration of the company you are with. I love Spanish food. I was lucky enough to visit Barcelona 10 years ago, and loved the simple food (cured ham and bread, rubbed with garlic) and the complex (paella!) Of course, the “patatas bravas” and the “tortilla espanola” were delicious. And who can resist some Spanish wine to accompany the meal? I tried paella once and it was time consuming. I consider myself a pretty good cook but I didn’t make it a second time (it was delicious however). What I really love to eat are tapas and I’m really good at making those. That’s because mostly all you do is slice meat and cheese (I am REALLY good at making that) Thanks for running the contest, I really like your site – very classy. I just recently moved from Chicago back to my hometown outside of Cincinnati. I loved going to all the tapas restaurants when I lived in Chicago, but in Cincinnati they are in short supply. I have decided to start cooking some of these Spanish recipes on my own, and this book would be a wonderful way to help me do this. Thanks Andrea for your blog, I love reading all your new recipes! I would love to win a copy of this book. Unfortunately, I have not had the opportunity to experience Spanish food – it is a new cuisine for me. I recently purchased some smoked paprika and was stunned at the wonderful flavor it gives to every dish I have put it in. I am helping my son learn to cook. When he is home from college, he picks a recipe and we work together to make it. Many are recipes I have never made, so it is a learning experience for both. We both love to try new foods, so this cookbook would give us a whole new country to explore! I got the original Tapas book last week at Goodwill and per someone’s rave on Amazon reviews, I tried the Shrimp in Almond Sauce. It is a lovely dish I’ve now made 3 times just for myself. Its also fun to put together. Have you heard of Emalee Chapman? She wrote 15-minute cookbooks back in the 80s I think. I just tried her “Spanish Omelet” which is a basic tortilla. It is wonderful and a wonderfully simplified version that tastes authentic. I warm 2 TB olive oil in a 9-inch skillet (with a lid for later). Add one chopped small onion. While that’s frying, finely chop 8 ounces of small red potatoes (upeeled) in food processor and add them to the pan. Stir until they start to brown. Cover and cook 3 minutes til soft. I also add salt here, which the author doesn’t. While it cooks, beat 3 eggs with 2 TB water and stir into the softened mixture in the pan. Cook for 2-3 minutes til nearly set (I like 2 minutes so its nice and moist). Then sprinkle with 2 TB chopped fresh parsley, season with pepper, and fold in half (or roll into thirds like a French omelet. If you roll it that way, you can tip it out onto a medium size French gratin dish, and it fits perfectly and makes a nice presentation. Serves 2. I had it for breakfast today. Can you recommend any other recipes from the book, and is the new one worth purchasing for the new recipes? Hi John. I don’t have a copy of the original book, so I can only speak to the revised version, which according to the publisher has 50 new recipes. My favorite recipes from the book are the pisto manchego, chickpeas in onion sauce, the eggplant salad, and the crab tartlets. I hope this helps!